Obverse: Bust of crowned James I facing right, XII to left of head. Text around LACOBVS DG MAG BRIT FRAN & HIB REX (James by the grace of God King of Great Britain France and Ireland). Reverse: The arms of Scotland. The rampant lion of Scotland in the first and fourth quarters, the English arms in the second quarter and the harp of Ireland in the third. Text around QVAE DEVS CONIVNXIT NEMO SEPARET (What God hath joined together let no man put asunder). 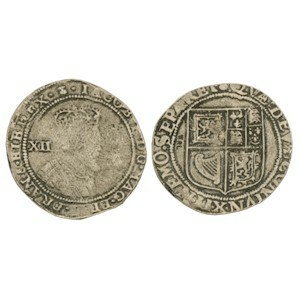 History: This coin was minted at Edinburgh, after James VI had become James I of England. This Scottish shilling has the same value as an English shilling, twelve pence.